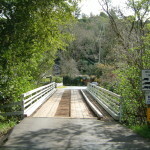 Meadow Way Bridge, over San Anselmo Creek, was constructed in the 1950s. The 70-foot long structure supports one narrow 10-foot wide traffic lane nearly 25 feet above the creek bed. The bridge spans an average to relatively wide section of San Anselmo Creek at a very sharp left channel bend, and serves as the only egress and ingress point to nearly two dozen residences across the creek from Cascade Drive. This site’s unique geometry, combined with the channel bed soil type and significant creek flows, has created serious erosion and bridge foundation problems. Due to the compromised foundation, poor deck condition, functional limitations, and insufficient lane and sidewalk widths, this bridge has a low Sufficiency Rating of 44.1 out of 100 and Caltrans has designated it as “functionally obsolete”. October 24, 2018: We have continued to make progress on bridge design, and recently received a few questions from neighbors. Bridge condition updates, project status and latest timeline October 2018 (PDF). The purpose of the project is to address the needs of the Meadow Way Bridge so that it is safe and up to code. Local concerns will be balanced with federal and state rules underwriting the program, safety issues, and the Town’s future maintenance costs. The Town and project team will explore a wide range of possibilities to provide a functional, safe and context appropriate bridge, utilizing technical advances from the last 50-60 years. During all phases of the project, measures will be taken to minimize impacts to residents living near the bridge and to the ecology of the creek. Construction activities and duration within the creek must comply with a variety of restrictions and agency requirements. The project must be sensitive to fish, wildlife and plant impacts, noise ordinances, and recreational uses of the Creek, according to regulations from the Regional Water Quality Control Board, the US Army Corps of Engineers, and the Department of Fish and Game. The project must clear both federal and state environmental requirements (NEPA and CEQA) to qualify for federal and local funds. The Meadow Way Bridge is eligible for Highway Bridge Program (HBP) funding, which may include federal funds for its assessment and construction of the improvements. Federal funds would cover 88.53% of the project’s engineering, environmental assessment and construction costs; this funding is supplemented by Toll Credit Program, another federal program, which will pay the Town’s 11.47% share during construction. This provides a great opportunity for Fairfax to make significant infrastructure improvements with relatively small financial outlays. Input was gathered from nearby residents and other stakeholders, such as environmental groups, in late 2013 and early 2014. Environmental studies were initiated during 2015 and 2016, and preliminary designs were developed during 2017. Environmental studies for both NEPA and CEQA and the preliminary bridge design are ongoing as of late 2018. When final environmental documents have been circulated and are complete, the permit application process will begin, in 2019. For efficiency within the construction process and minimum disruption to the neighborhood, construction is anticipated to begin in 2020. Communications with the neighborhood will remain open leading up to, and through, the construction period. A record of previous outreach, project updates, Caltrans documents, and online communication is available at the Meadow Way Project Archive Page.